(Part 2/2) The Latin American Masters Art Gallery, also found at the Bergamot Station, opened the world wondrously to the late Peruvian Fernando de Szyszlo, whom the gallery labeled the “last Modernist”. And it is easy to understand why. Mr. Szyszlo exhibited interest in working with abstraction, but not to a pedantic degree. These are not studies in other words, but fully fleshed masterful representations of the Modernist movement. His Regreso a Mendieta is a terrific example. First, the medium used is eclectic, being charcoal, acrylic and pastel. This is beyond academic then, and handled by an artist so comfortable with bringing into being a new creation that he finds it undaunting to bring about effectively a mixed media artwork. Though when we think of mixed media in contemporary art, we are often times involving ourselves with a printing technique, maybe digital visuals or physical materials integrated into the canvas, like a Jasper Johns would do. But here, the media is subservient to the visual and is not attempting to be strenuously tactile, diverting our attention to experience the medium in itself. We have then an elegance, a veritable harmony in the work. A sense of balance with the geometries, as if they can be left holding their structure in perpetuity. This is a restful, poised, painting, and happily inconsiderate of perfectly sharpened lines; for what is being sought after is an idea rather than a real object. And thusly, constitutionally Modernist with the distinct break from being bound to the phenomenal as subject matter. Mr. Szyszlo also had several pieces which experimented with the most seductive of colors, red. But it must be reiterated again that these are not experiments, but the fullest mastery of Mr. Szyszlo’s artistry. Paisaje de Paracas is an idea of a Peruvian beach landscape, plausibly with the strict ocean-blue demarcating line representing a horizon, with the lively and contorted abstract figure being the shining sun. Notice with this interpretation, we are taken completely outside of a normal human subjectivity yet still hold a sense of it with our preconception of what a horizon and circular shape in the sky means. We are then treated with a sense of dynamism with the supposed solar flares thrusting outward from the black body radiation into a perceptual kaleidoscope of reddish hues, which are totally entangled and ostensibly wrestling to be released first and reflected unto the object upon the sandy shore. This flirts with surrealism yet is not so decidedly absurd. It’s figuratively abstract but not toward the absolute abdication of a phenomenal realm. Last for the night was the opening of a brand-new gallery, Square Rhino Projects, in Venice featuring iridescent photography from Brent Broza. 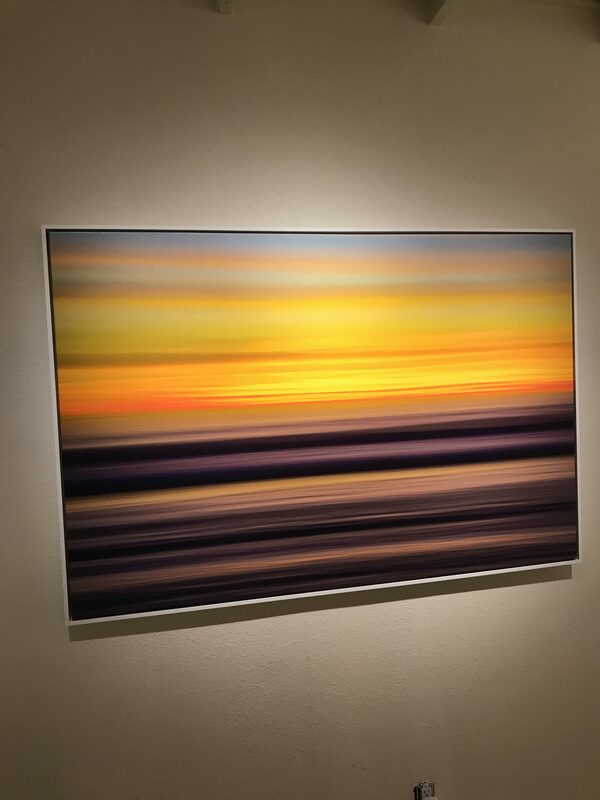 His art gives the impression they are fine paintings, but they are indeed photographs of the sunsetting upon the ocean. It is surreal to be able to taste with the eyes this confectionary of colors. The fact that he was able to alchemically unveil them from nature is the grand feat here. For the mind instantly believes they are paintings stemming from the ingenious use of color being necessarily seeded from the mind of a human creator. The fact, however, we are able to glean this same color from our own creator, Nature, is an act of transcendental deliverance, allowing us to expand our ideas of being.